As of its opening release in BT07, Cray's collective greatest intelligence has access to three primary play styles. With an overall theme of empowering and then retiring the rearguards, the challenge for a Great Nature cardfighter is to turn the loss of the rearguards into an immediate gain. Acorn Master is the initial first vanguard introduced to the clan, being a standardized counterblast 1 to soulcharge the Master and search the top five cards of the deck for a grade 3 Great Nature unit. Like all of these, the primary problem with this is that the skill is most useful later in the game when more cards from the deck have been removed, but after various retire-based units would have hit the field. And while Acorn Master has the advantage of his skill always going off, it's obstructed by Great Nature being a counterblast-heavy clan with less options for damage unflipping than their peers. In general, even that one open damage that would be spent on Acorn Master can be better reserved for other units. Flask Marmoset comes with more guarantees, and is an easier style to fit in. Having transplanted his ability from set 2 predecessors Rue and Intelli-Mouse, Marmoset counterblasts 2 to empower a rearguard by 4000, retiring them in the end phase. While this makes him expensive and difficult to support due to the same lack of unflipping skills that hurts Master, Marmoset is a reliable variation on the Intelli formula, in that like Intelli he sticks around on the field after his using his skill. Unlike Intelli, Marmoset can move to the rearguard when ridden over and will still be able to boost a unit after empowering another. He benefits most from the Hammsuke series, which counterblasts 1 when the unit would be retired in the end phase to add an additional Hammsuke to the hand. By applying Marmoset's skill to any of the Hammsukes with Silver Wolf as the booster, this creates a self-replacing unit with 18, 20 and 22000 power, enough to force a minimum of three cards out of the opponent's hand to defend with in most situations. Flask Marmoset can also be combined with Element Glider, who returns to the hand when the attack of the unit he boosts hits. As this takes place before the end phase in which Marmoset would retire Glider, this turns Glider into a 10000-power booster which will return to the hand, allowing for consistent 20000-power and higher attacks with no loss to hand power. Paired with the grade 3 Magnet Crocodile's +2000-power on-attack ability, this will easily replicate the aforementioned Hammsuke strategy while eliminating the need for another counterblast to replace lost cards altogether. With Marmoset, there are two primary grade 3s available, the clan's resident limit breakers Apt and Leopard. School Dominator, Apt gains a standardized +5000 power at limit break 4, and when his attack hits he can retire a Great Nature unit to superior call another from hand in its place. Apt's play style is one suited best to the clan's two stand triggers, as that 10000-power Element Glider can be standed while the Compass Lion or Geograph Giant placed before it can be replaced by a fresh unit. Apt himself has a custom 11000-power booster from Feather Penguin, but unlike other +5000 limit breakers Apt cannot search out his own booster. As a result, the space behind him is likely to be occupied by Flask Marmoset. With one of the Hammsuke cards occupying whichever circle you aren't going to superior call onto, an idealized final turn with Apt is looking to be a counterblast 4, repeating Marmoset's counterblast once for a double-empowered Glider, then activating Apt's skill after a stand trigger stands Glider, replacing whatever Glider boosts with a 10000-power unit. If the power from the stand trigger were given to Apt, then we're looking at three attacks exceeding 21000 power, two 24-25000 from whatever Marmoset boosts, and one 24000-power attack from Apt, leaving only the third column which will likely be striking for at least 16000 power. While idealized and impeded by Apt's skill requiring him to hit, this theoretical turn is the basic pattern behind Marmoset and consequently Apt's play style. It hangs heavily on stand triggers to support it, which at present Great Nature has two of--Eraser Alpaca and Alarm Chicken. As such, the style will need Alarm Chicken as an additional stand in order to see major success. Apt's skill can also be used less conventionally; as his drive checks will be complete at the time that his skill is activated, one could retire a still-standing Great Nature booster to replace with a more powerful booster. This maneuver carries the heavy advantage of being completely unable to predict, as the opponent will not be able to determine ahead of time whether you will go through with replacing a unit that has already attacked or making a standing unit more powerful. Much as with Murakumo, these unpredictable tactics require a skilled cardfighter to bring out the potential in, and can turn the tide of the fight. Alternative to Apt is the School Hunter, Leopard. His limit break is surprisingly mundane, at a low cost of counterblast 1 to revive a Great Nature unit put into the drop zone in the end phase and call it into an open rearguard circle. This skill can be repeated individually for each unit as they are retired, nullifying the typical reduction in field size, and when met with the ever-important Hammsuke line counterblasts, allows a Leopard fighter to act with a completely refilled field and hand. Leopard's secondary skill fuels his first, giving +4000 power to another Great Nature on-attack, then retiring them in the end phase. While Leopard is strong and has the same room for versatility as Apt, his play style is somewhat lacking in support until Blue Storm Armada. Loop-the-Loop, Duckbill of that booster set allows one rearguard to be designated on his call, and if that unit is sent to the drop zone in the end phase then the cardfighter who called Duckbill may draw a card. By forming a three-card combo between Leopard, Hammsuke and Duckbill, for a counterblast 2 the player will add two cards to their hand in addition to calling the original Hammsuke to the field, turning what was designed as a one-card disadvantage into a two-card gain. Alternatively, Tic-Toc Flamingo is Duckbill but with unflipping one damage replacing the draw skill, modifying the turn's overall cost to be a counterblast 1. Both of the clan's limit breakers have assistance from Explosion Scientist Bunta and Failure Scientist Ponkichi, grade 1 and 2 units respectively which can counterblast 1 to add a damage to the damage zone, allowing for limit break to be activated at an earlier stage in the game than normal. When matched with aggressive early game attacks, this can easily catch off guard an unprepared opponent, in some cases one still at grade 2 and lacking the hand necessary to defend three or more full-power attacks. Bunta and Ponkichi work evenly between the two limit breakers, as both Apt and Leopard can get off both Marmoset and their own skills in the same turn that Bunta was called. As stated, Marmoset's play style is counterblast heavy and at its prime requires a counterblast 3 to pull off regularly, in a clan that has very few resources to unflip damage with. So while Marmoset's play style comes with plenty of variation and has multiple ways to pump out 21000-and-above power attacks, the cost is heavy and Flask himself is vulnerable to cards like Kimnara, Gatling Claw and Saishin retiring him. To counter this, Great Nature has an alternative play style from the Lox series of evolving cards. While less costly, the style depends on the same type of mechanics originally started by Fullbau in BT04, and perfected by Riviere in EB02. Missing the opening ride still provides a free 4000-power booster as it would with Marmoset and Acorn Master, but the benefits conferred by that booster are more dubious when the grade 1 Lox's absence from the soul prevent the series' other skills from activating. Breaking the series down in ascending grade, Schoolyard Prodigy Lox can add either the grade 2 or grade 3 form of himself to hand when ridden over with Bringer of Knowledge Lox. Next in sequence, the Bringer of Knowledge allows for up to two Great Nature rearguards to be designated when ridden over with Law Official Lox; when those designated cards are retired in the end phase of the turn, the turn player will be able to draw a card. To facilitate this skill's use are the grade 1 units Tank Mouse and Monocular Tiger, and the grade 2 Binoculars Tiger and Compass Lion. Tank Mouse is an exact replica of Intelli-Mouse's skill, empowering a unit at the cost of a booster and of retiring that unit. Compass Lion is an 11000-power rearguard that must retire a rearguard in the end phase of the turn in which it attacked, guaranteeing that the Law Official's skill will go through. Tank Mouse and Lion's skills can even be combined to retire one another, making Lion a 21000-power attacker with as low as a 6000-power boost from a unit like the aforementioned Element Glider, effectively resetting the field and hand at the end of the turn. The best application of Lox's skills is to the previously lauded Hammsuke line. Rather than a counterblast 3 in the turn as with Marmoset, the Hammsuke cards are back to their comfortable counterblast 1, replenishing the hand while including a draw as part of their newly applied skills from Lox. The result is similar to some of the effects of Bermuda Triangle cards, but limited by the amount of Hammsukes that can be included in a single deck. The returns are more dramatic than those presented in the Apt-Marmoset build and come at a lower cost, but are less likely to go off because missing the opening ride will interrupt them. Moving onto the Law Official himself, he shares his predecessor's skill, designating two Great Nature rearguards when ridden over with Guardian of Truth Lox. The Guardian of Truth can even reinforce this skill's power with his persona blast, counterblasting 2 and sending a copy of himself to the drop zone to give +4000 power and +1 critical to one rearguard, then retiring that rearguard in the end phase. By designating one of the same units as when Law Official was ridden over, this allows for up to six damage to be dealt in a single turn, providing for criticals from the Guardian of Truth. Though that's unlikely to happen, the amount of cards a total +8000 boost demands is overwhelming when two of the cards on the field can deal two damage on-hit. This is more power than Soul Saver Dragon could ever muster, and with a correct lineup of Hammsukes supported by 6-8000-power units, we're looking at a field of 20000-power-and-up rearguard attackers with a vanguard that can trigger into the same numbers while defending with 11000 power on the opponent's turn. Even should the attacks not all go through, the cardfighter that brings both of these skills out will maintain more than a full hand to defend with. This is all while demanding two 10000-shield cards to fully protect against each attack--even accounting for perfect defense, this will leave a massive hole in the opponent's hand while the Great Nature player will continue to hold out on their turn with a full hand. For support Lox has Great Nature's draw trigger, General Cat, who will most likely replace stand triggers in his build. The grade 2 Binoculars Tiger and Compass Lion are both built around retiring other units, Binoculars giving +4000 power to another unit when his attack hits the vanguard and retiring that same unit in the end phase, where Compass Lion retires a unit in the end phase of the turn he had attacked. These two skills can easily be combined with grade 1s called in the previous turn to trigger Lox's draw power, while Lion even offers an alternative grade 2 vanguard, as a highly defensive 11000-power unit. Like Duckbill and Tic-Toc, Compass is to be introduced in BT08 and is one card to keep in mind for the future when planning a Great Nature deck. The Lox series is cheap and self-fueling, as the cards it needs to set off its powerful attacks toward the end of the game can be drawn through the earlier series' skills. Its returns far outmatch the Apt-Marmoset strategy, while being less consistent and with a lower overall cost. 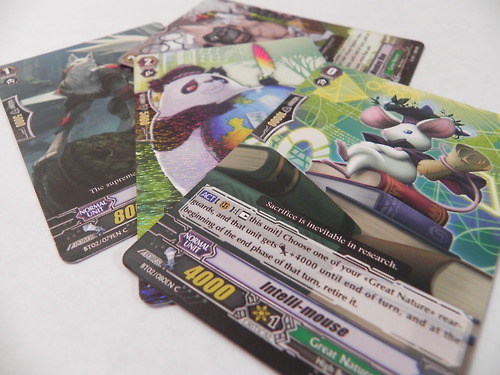 The two strategies are difficult to distill due to Lox's persona blast and evolving nature requiring that four of each card in the series grades 1-3 be included in the deck, one of which is RRR and so will be expensive to acquire. In closing, Lox is much more compelling if you can get off his opening ride, but with no way to soulcharge his grade 1 form should the ride be missed, he can be somewhat inconsistent, while the Marmoset-Apt/Leopard strategy will almost always go off but lacks the same defensive and offensive push. When I revisit Great Nature next, I'll be covering how to overcome this clan's many counterblasts, along with additional cards introduced in Blue Storm Armada.